As the markets once again approach historic highs—the overly exuberant tone, extreme complacency and weakness in the economic data, bring to mind Bob Farrell’s 10 investment rules. These rules should be a staple for any long term successful investor. These rules are often quoted yet rarely heeded—just as they are now. Bob Farrell is a Wall Street veteran with over 50 years of experience in crafting his investing rules. Farrell obtained his masters degree from Columbia Business School and started as a technical analyst at Merrill Lynch in 1957. Even though Farrell studied fundamental analysis under Gramm and Dodd, he turned to technical analysis after realising there was more to stock prices than balance sheets and income statements. Farrell became a pioneer in sentiment studies and market psychology. His 10 rules on investing stem from personal experience with dull markets, bull markets, bear markets, crashes and bubbles. In short, Farrell has seen it all and lived to tell about it. 1. Markets tend to return to the mean (average price) over time. Like a rubber band that has been stretched too far – it must be relaxed in order to be stretched again. This is exactly the same for stock prices which are anchored to their moving averages. 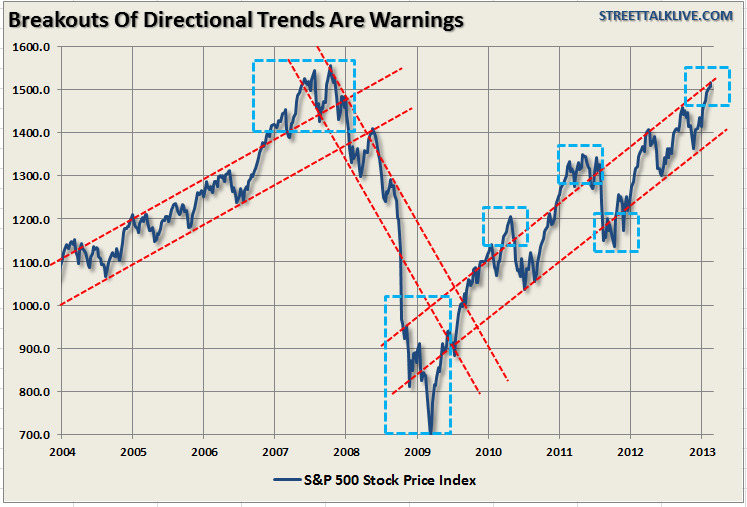 Trends that get overextended in one direction, or another, always return to their long-term average. Even during a strong uptrend or strong downtrend, prices often move back (revert) to a long-term moving average. The chart below shows the S&P 500 with a 52-week simple moving average. 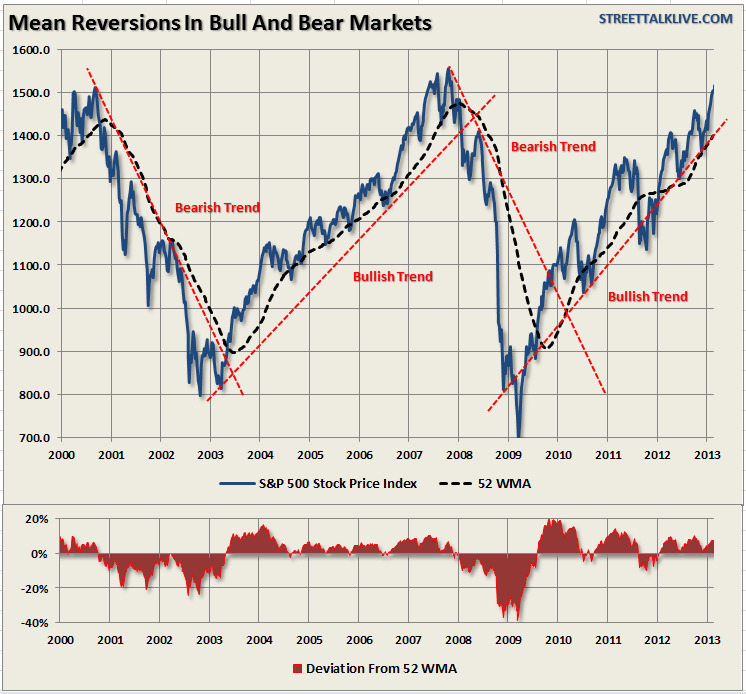 The bottom chart shows the percentage deviation of the current price of the market from the 52-week moving average. 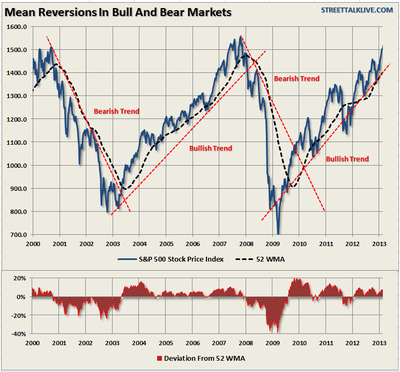 During bullish trending markets there are regular reversions to the mean which create buying opportunities. 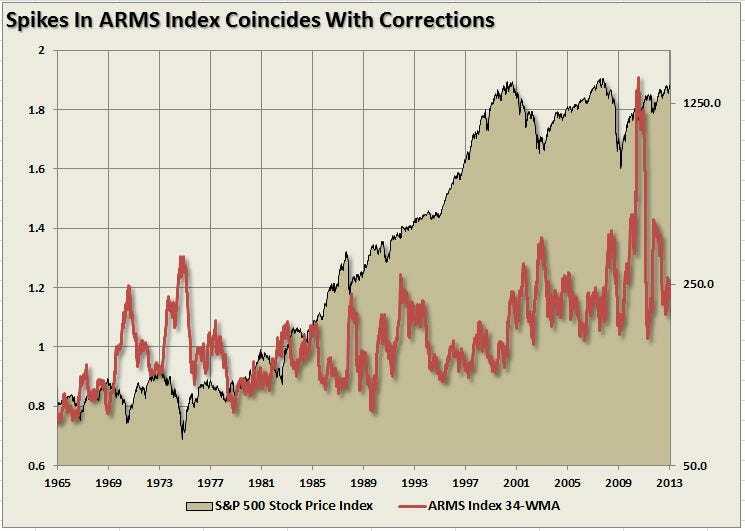 However, what is often not stated is that in order to take advantage of such buying opportunities profits should have been taken out of portfolios as deviations from the mean reached historical extremes. Conversely, in bearish trending markets, such reversions from extreme deviations should be used to sell stocks, raise cash and reduce portfolio risk rather than “panic sell” at market bottoms. The dashed RED lines denote when the markets changed trends from positive to negative. This is the very essence of portfolio “risk” management. 2. Excesses in one direction will lead to an opposite excess in the other direction. Markets that overshoot on the upside will also overshoot on the downside, kind of like a pendulum. The further it swings to one side, the further it rebounds to the other side. This is the extension of Rule #1 as it applies to longer term market cycles (cyclical markets). 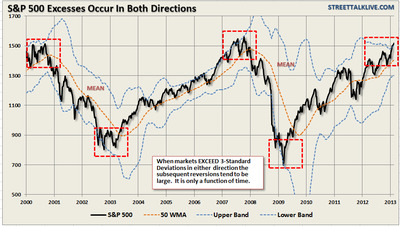 While the chart above showed prices behave on a short term basis – on a longer term basis markets also respond to Newton’s 3rd law of motion: “For every action there is an equal and opposite reaction.” The first chart shows that cyclical markets reach extremes when more than 3-standard deviations above the 50-week moving average. For the first time since the lows of the market in 2009 this has now occurred. Notice that these excesses ARE NEVER worked off by just going sideways. 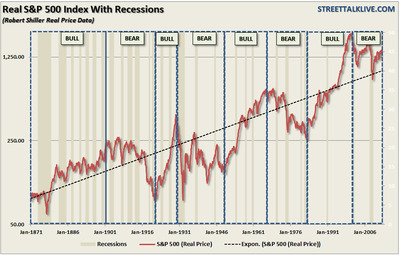 The second chart shows the price reversions of the S&P 500 on a long term basis and adjusted for inflation. Notice that when prices have historically reached extremes – the reversion in price is just as extreme. 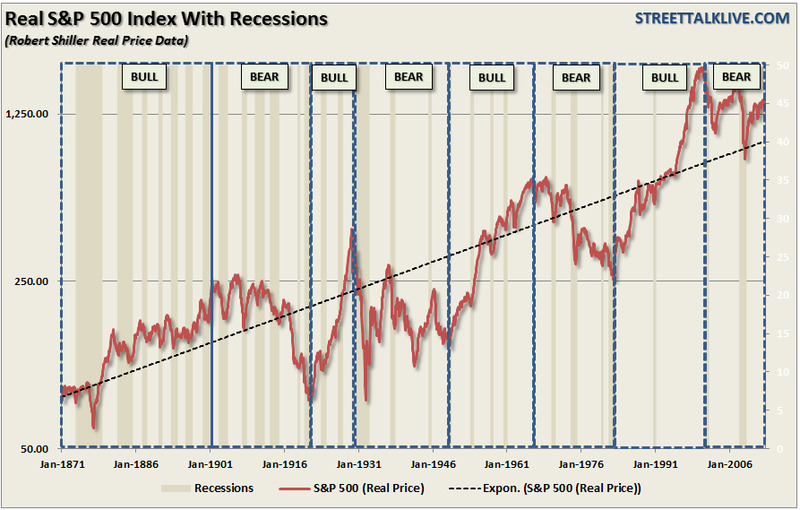 It is clear that the current reversion in the stock market is still underway from the 2000 peak. 3. There are no new eras – excesses are never permanent. The reality is that excesses, such as we are seeing in the market now, can indeed go much further than logic would dictate. However, these excesses, as stated above, are never worked off simply by trading sideways. Corrections are always just as brutal as the advances were exhilarating. 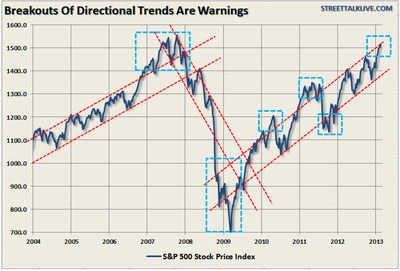 As the chart below shows when the markets broke out of their directional trends – the corrections came soon thereafter. 5. The public buys the most at the top and the least at the bottom. The average individual investor is most bullish at market tops and most bearish at market bottoms. 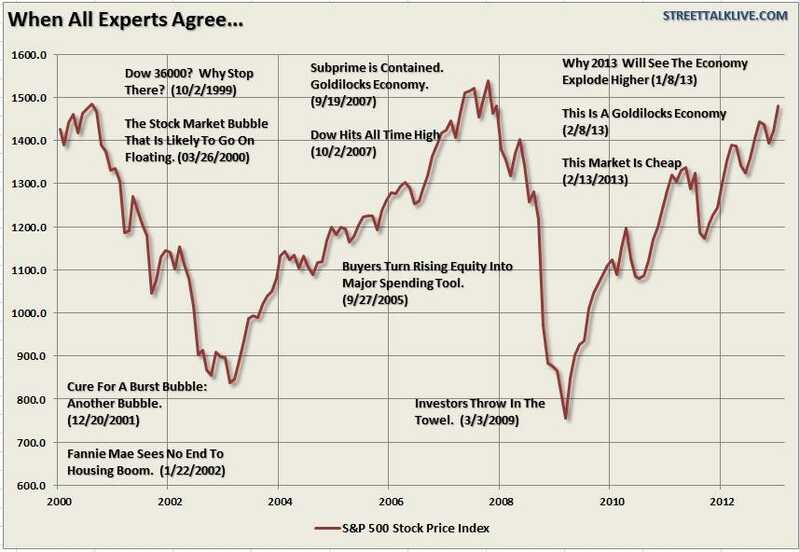 This is due to investor’s emotional biases of “greed” when markets are rising and “fear” when markets are falling. Logic would dictate that the best time to invest is after a massive selloff – unfortunately this is exactly the opposite of what investors do. 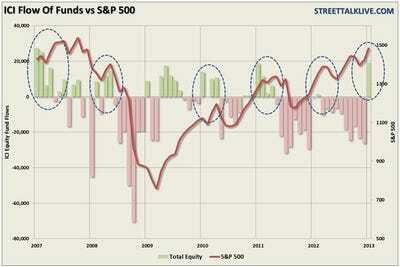 The chart below shows the flow of money into equity based mutual funds. 6. Fear and greed are stronger than long-term resolve. As stated in Rule $5 it is emotions that cloud your decisions and affect your long-term plan. 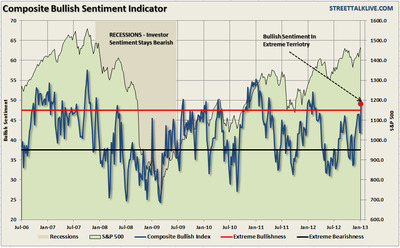 The composite index of bullish sentiment (an average of AAII and Investor’s Intelligence surveys) shows that “greed” is beginning to reach levels where markets have generally reached intermediate term peaks. Currently, those “people” are getting extremely greedy. 7. Markets are strongest when they are broad and weakest when they narrow to a handful of blue-chip names. Breadth is important. A rally on narrow breadth indicates limited participation and the chances of failure are above average. The market cannot continue to rally with just a few large-caps (generals) leading the way. Small and mid-caps (troops) must also be on board to give the rally credibility. A rally that “lifts all boats” indicates far-reaching strength and increases the chances of further gains. The chart above shows the ARMS Index which is a volume-based indicator that determines market strength and breadth by analysing the relationship between advancing and declining issues and their respective volume. It is normally used as a short term trading measure of market strength. However, for longer term periods the chart shows a weekly index smoothed with a 34-week average. Spikes in the index has generally coincided with near-term market peaks. 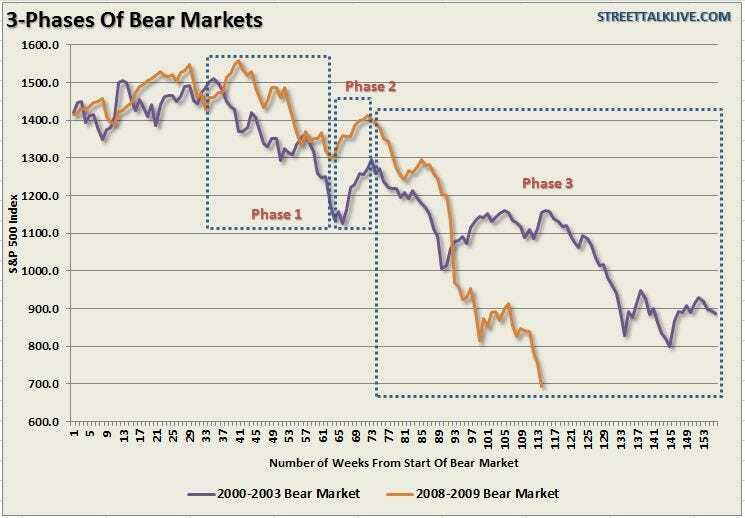 Bear markets often start with a sharp and swift decline. After this decline, there is an oversold bounce that retraces a portion of that decline. 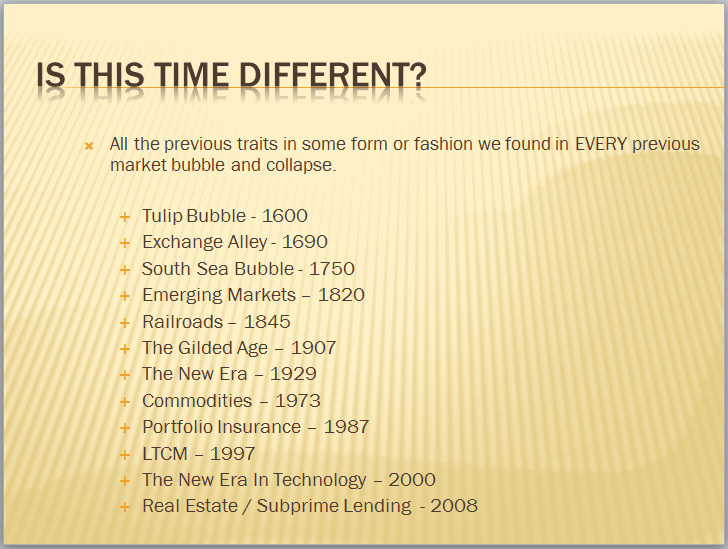 The longer term decline then continues, at a slower and more grinding pace, as the fundamentals deteriorate. Dow Theory suggests that bear markets consists of three down legs with reflexive rebounds in between. The chart above shows the stages of the last two primary cyclical bear markets. There were plenty of opportunities to sell into counter-trend rallies during the decline and reduce risk exposure. 9. When all the experts and forecasts agree – something else is going to happen. The point here is that as a contrarian investor, and along with several of the points already made within Farrell’s rule set, excesses are built by everyone being on the same side of the trade. Ultimately, when the shift in sentiment occurs – the reversion is exacerbated by the stampede going in the opposite direction. 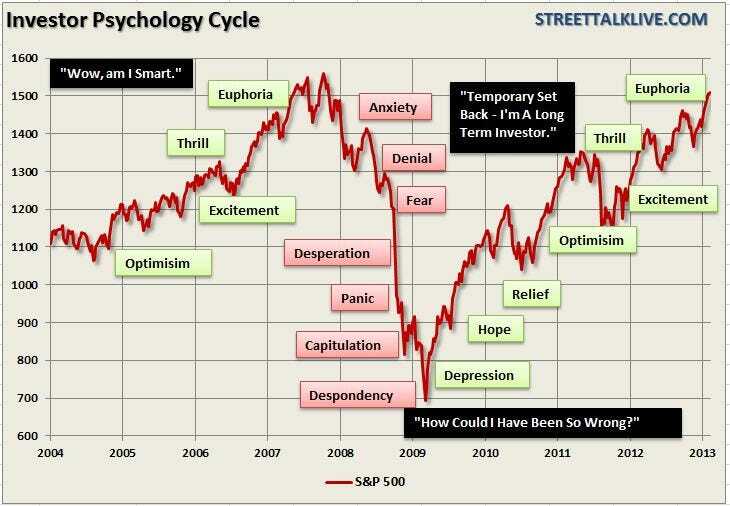 Psychologically, as the markets rise, investors begin to believe that they are “smart” because their portfolio is going up. In reality, it is primarily more a function of “luck” rather than “intelligence” that is driving their portfolio. Investors behave much the same way as individuals who addicted to gambling. When they are winning they believe that their success is based on their skill. However, when they began to lose, they keep gambling thinking the next “hand” will be the one that gets them back on track. Eventually – they leave the table broke. It is true that bull markets are more fun than bear markets. 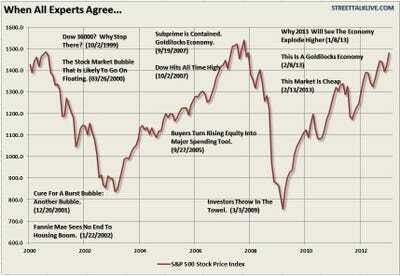 Bull markets elicit euphoria and feelings of psychological superiority. Bear markets bring fear, panic and depression. What is interesting is that no matter how many times we continually repeat these “cycles” – as emotional human beings we always “hope” that somehow this “time will be different.” Unfortunately, it never is and this time won’t be either. The only questions are: when will the next bear market begin and will you be prepared for it? Like all rules on Wall Street, Bob Farrell’s rules are not meant has hard and fast rules. There are always exceptions to every rule and while history never repeats exactly it does often “rhyme” very closely. Nevertheless, these rules will benefit investors by helping them to look beyond the emotions and the headlines. Being aware of sentiment can prevent selling near the bottom and buying near the top, which often goes against our instincts. Regardless of how many times I discuss these issues, quote successful investors, or warn of the dangers – the response from both individuals and investment professionals is always the same. No you’re not. Yes, they do. 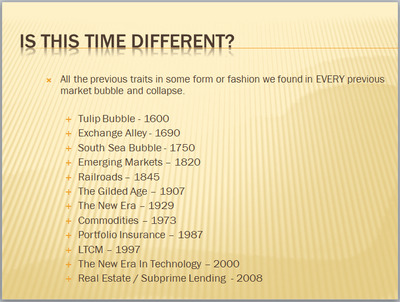 Individuals are long term investors only as long as the markets are rising. Despite endless warnings, repeated suggestions and outright recommendations – getting investors to sell, take profits and manage your portfolio risks is nearly a lost cause as long as the markets are rising. Unfortunately, by the time the fear, desperation or panic stages are reached it is far too late to act and I will only be able to say that I warned you.